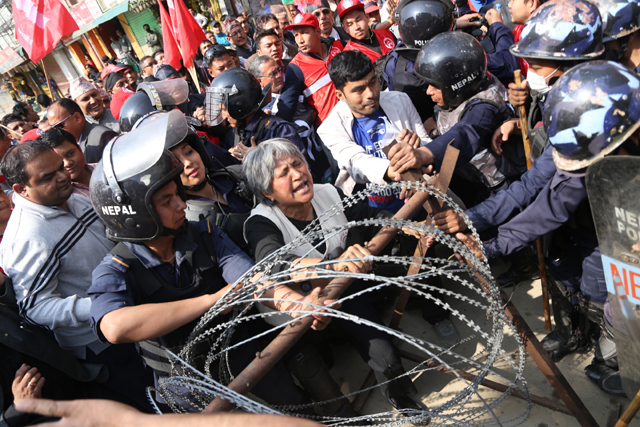 Police arrested Naya Shakti Party leader Hisila Yami on 2 April as she protested the Election Commission's decision on political party symbols. Nepal’s governing cartel has relentlessly tried to monopolise politics through Parliament. A clause in the first law regarding elections enacted after the promulgation of the new constitution reserves the right to contest elections under a common election symbol for the parties which are currently in Parliament. New political parties, or ones that did not secure a seat in the last Parliament or ones that boycotted past polls, are forced to field independent candidates under different symbols. This is a brazen display of political chicanery. Naya Shakti Nepal, led by ex-Maoist Prime Minister Baburam Bhattarai, protested this provision in front of the Election Commission building despite the fact that it has opposed the 14 May local elections in line with the Madhesi parties. The Election Commission, which is constitutionally bound to function within the legal framework enacted by Parliament, has rightly expressed its helplessness. Another new party, Bibeksheel Nepali, has taken the matter to the Supreme Court, which has delayed the case, scheduling a hearing just two days prior to 14 May. From the government’s side, there has been no effort to explain the rationale behind this strange and undemocratic rule. Evidently, there is none. The only unmerited benefit of doubt that we can give lawmakers may be that the ever-increasing number of political parties is technically too difficult to manage for elections. Some joked on social media that the ballot paper is going to be longer than the average height of Nepalis. This pattern of manipulating the legitimate process for dishonest ends is the hallmark of rulers everywhere. Its extreme form is when leaders change the constitution to remain in power. Many African rulers have resorted to constitutional coups for decades by turning their democracies into semi-dictatorships. Often, when a particular leader becomes strong enough to control the polity, legitimate politics (decision-making by the majority) is exploited to fulfil the interests of the leader. In Nepal, the decade-long era of conflict and another decade of misplaced priorities has, in the name of transition, created a culture of rule by consensus of the Top-Heads. This supposedly transitional political culture has created many spin-offs: senior leaders have been able to monopolise power within the party, and second rung leaders have followed them to become the clone practitioners of this leadership style among their group of followers. With political parties as the only effective instrument as of now for diverse interest groups, the major political parties have been able to monopolise political discourse. The media, the only source of input in Nepal’s brain dead civil society, has been compromised because of the interlinking of group interests and hence fails to stand up to its responsibility. Due to these dynamics, the top leaders have been able to redefine the notion of accountability. They have gone to the extent of publicly suggesting reforms in the political structure of the nation to defend their undemocratic decisions and unethical practices. Recently, when the Supreme Court intervened in the government’s decision to appoint the chief of police by trampling on seniority rules, the Nepali Congress declared the decision as judicial overreach into the arena of the executive branch. The NC’s Sashank Koirala, son of the first elected prime minister of Nepal, went to the extent of saying that the judiciary should be kept under parliament. Let’s accept that politics isn’t easy. There are clashes of opinions and interests, which creates the ground for an unrelenting struggle of one-upmanship. However, in a peaceful and mature political tradition the struggle is legitimate because it follows rules. The written constitution or even customary obligations are supreme. Interest groups, represented by political parties, fight on a level field under strict rules that apply to all. But when there is an uneven playing field, politics is bound to break the established framework of laws and traditions. The players resort to violent means. Order breaks down, there are crises, and politics – in a desperate struggle for survival – puts a nail in its own coffin by resorting to even harsher means. It crumbles under its own weight due to an imbalance in its outlook towards differences of opinion. Nepal has often gone through this. The events may vary, but the pattern is evidently similar. And history seems to be repeating itself. The worrying part is, as always when lessons go unnoticed, history comes up with newer and harsher ways. Nepal is not a substantial contributor to climate change and may not suffer its worst immediate impact, but it could be seriously affected by melting glaciers like Tsho Rolpa. Ujeli came to Kathmandu from Okaldunga, got lost and lived as the "madwoman" of Samakhusi for over two years. "Elections under the Congress will not be fair"
"Without us you are nothing"